During an emergency you want to trust that your eyewash is going to perform well for you. You want to know that it works, and that it will provide clean fresh water every time. Do you need an eyewash? Locate your nearest eyewash as well as a secondary one. Do you understand how to use it? Emergency eyewashes operate with simple controls, such as paddles, levers, or squeeze releases. They are designed for hands-free operation. Once you turn it on, it should stay on. Any protective caps should automatically open or release, and the flow of water should be clean, even, and tepid (not too hot or too cold). 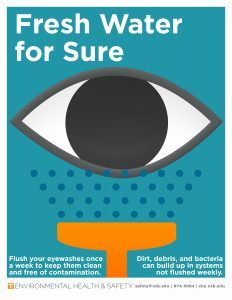 Is your eyewash maintained and tested? Ask your supervisor about the upkeep of your eyewash. Principle Investigators and Lab Managers should test or designate someone to test your eyewash station weekly. Ensure that the eyewash station is easily identifiable and unobstructed. Carts, chairs, glassware, and equipment can obstruct an eyewash station, slowing or preventing emergency response. If you need an eyewash station, you will not be able to see very well, and you could be highly distracted by pain, discomfort, or confusion. Ensure that the eyewash station activates easily with one-handed control, the flow removes eyepiece covers, and water flows evenly and in a steady stream. Allow the eyewash station to run for 1-3 minutes to flush stagnant water from the line. If this is your first time flushing the station, you may have to run it longer to ensure that the water is clean. Report malfunctioning eyewash stations to Facilities Services at 865-946-7777. If your eyewash station does not have a drain, ensure you use a bucket to capture the water. Make sure you know where the water drains! Often a bucket or a tray has to be positioned under the unit’s drain to collect the water. Have a roll of paper towels on hand in case of water leakage. A large tray may be needed to collect the water under units that pull down from the wall to activate. If you have questions please contact EHS at ehs_labsafety@utk.edu or 865-974-5084. For more information, visit the Eyewashes and Safety Showers Program page.